Like humans, fish prefer to group with individuals with whom they are familiar, rather than strangers. This gives numerous benefits including higher growth and survival rates, greater defence against predators and faster social learning. However, high carbon dioxide levels, such as those anticipated by climate change models, may hinder the ability of fish to recognise one another and form groups with familiar individuals. Scientists at the ARC Centre of Excellence for Coral Reef Studies at James Cook University, Australia, have been studying the effect of carbon dioxide on the schooling behaviour of the tropical damselfish Chromis viridis. Lead investigator Miss Lauren Nadler found that juvenile fish normally require three weeks to recognise their school-mates, however elevated carbon dioxide levels significantly impaired this ability. Climate change models predict that carbon dioxide levels and ocean acidity will more than double before the end of the century. To investigate if this would affect social recognition in fish, schools were kept under elevated levels of carbon dioxide, similar to those projected for 2100 by models produced by the Intergovernmental Panel on Climate Change (IPCC). Individual fish were then given a "choice test" where they were placed between two schools – one of familiar fish and the other made up of strangers. Whilst fish kept under normal conditions consistently chose the familiar school, fish reared under high CO2 conditions showed no preference for either the unfamiliar or familiar school. It is thought that carbon dioxide interferes with the functioning of neuroreceptors in the fish brains. Higher carbon dioxide levels change the concentration of ions (electrically charged atoms and molecules) in the fishes' blood, altering the way that the neuroreceptors work. This impairs basic senses, such as sight and smell, which are vital for recognition in fish. These results could have serious implications for tropical fish, whose habitat is already threatened by climate change. "Familiarity is an important trait for defence, particularly in a predator-rich environment like a coral reef", says Miss Nadler. "Since half of all fish species in the world school at some point during their lives, including economically important species, these effects could be critical for species that rely on group-living to avoid predators". 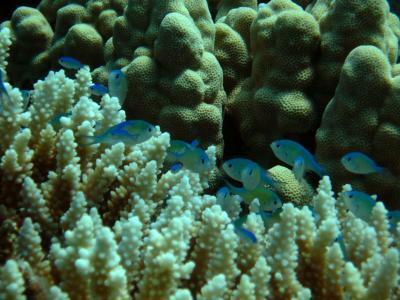 This image shows tropical damselfish (Chromis viridis) schooling in a coral reef.